As the Ohio Workers’ Compensation system is basically a “no-fault” program and employers make compulsory premium payments to the BWC, benefits and compensation are strictly set-forth in the law by the Legislature. In Tort cases (ie., personal injury cases), an injured person can recover all provable damages proximately resulting from an injury such as physical pain, loss of enjoyment of life, inability to perform usual/pleasurable activities, anxiety, mental suffering, loss of past and future earnings, impairment of earning capacity, loss of consortium (spouse), or conscious suffering an individual suffers prior to death. In some cases, punitive damages might also be awarded. In Tort cases, the aim of compensatory damages is to compensate a person for an injury caused by another’s wrongful conduct, and to the extent possible, restore the injured party to the position that would have been occupied if the wrong had not occurred (ie., to make the party whole again). In Tort law, the purpose is to right a wrong. In contrast, the goal of the Workers’ Compensation law is not to fully restore what the injured worker has lost, but to provide a safety net to protect the worker against consequences of a work-related injury or occupational disease so as to help prevent total financial ruin. Think of the Workers’ Compensation program as a safety net which prevents the worker from hitting the ground, but does not return the worker to pre-injury status. Workers’ Compensation benefits and compensation are paid only for the allowed and/or recognized conditions and their consequences in the claim. Approximately two-third of Ohio employers are state fund employers who pay semi-annual premiums to the BWC for coverage of its employees. Such employers are either private or public. A public employer is a governmental entity which includes the State, Counties and Municipalities. A public employer is a governmental entity which includes the State, Counties and Municipalities. Private employers include Corporations, Sole Proprietors, Partnerships, Limited Liability Companies, and other private businesses. In State Fund claims, the BWC pays for medical and compensation benefits for you. The BWC is also responsible for initial allowances/disallowances, future allowances, treatments, and other legal/medical issues. Self-Insured employers directly pay compensation and medical costs for work-related injuries. These employers pay their claims, assume all the liability and administer their own Workers’ Compensation programs. Normally these are very large corporations with a minimum of 500 employees working in Ohio who have been granted permission by the BWC to administer their own Workers’ Compensation programs. These employers have specific requirements which must be met under the law. While the BWC does not administer these types of claims, disputed issues are handled at hearings at the Industrial Commission of Ohio (ICO). If the self-insured employer goes bankrupt or can no longer meet the requirements of a self-insured employer, the BWC will take over administration of claims. An employer, under the law, who fails to establish or maintain Workers’ Compensation coverage through contributions to the State Insurance Fund, or, who fails to comply with requirements consistent with self-insured status is deemed a non-complying employer. If the State Fund employer’s coverage has lapsed, or has never been paid at the time the employee sustains a work-related injury or occupational disease, an employee may file a Workers’ Compensation claim with the BWC and/or pursue a personal injury case against the non-complying employer for damages based upon common law actions. However, the BWC is entitled to reimbursement of any benefits or compensation paid under the claim out of any monetary recovery on a personal injury case. 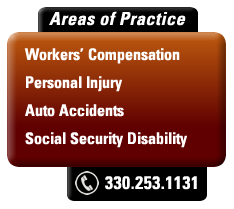 Ohio is an entirely State-run Workers’ Compensation program. In other words, private insurance companies are prohibited under the Ohio Constitution from underwriting Workers’ Compensation programs with employers. While self-insured employers directly pay medical benefits and compensation to injured employees, such employers are still under the State-run program. In State Fund cases, the BWC pays medical benefits which are reasonably related to the allowed conditions, are reasonably necessary treatment of the injury, and the cost of medical services are reasonable. Medical services are paid by a select managed care organization (MCO) chosen by year by the employer, or in some cases by the BWC. Such treatments include bills from treating physicians, chiropractors, chiropractic, physical therapy, occupational therapy, surgery, diagnostic tests, assistive aids such as a TENS unit, stimulators, braces, orthotics, hearing aids, exercise programs and dental treatments. This is not an exhaustive list. Some treatments require prior authorization from the MCO before payment will be made to the healthcare provider. The BWC has a current contract with SXC Health Solutions Corporation to pay for medications and prescriptions. As an injured worker, it is important that you provide the assigned MCO to each treating healthcare provider to make sure that your pharmacist sends prescription bills to SBX. Bills for related conditions or related injuries/conditions cannot be sent to your private health insurance company as payments by the insurance company usually exclude occupationally related injuries or diseases. When a claim application is filed with the BWC, the BWC will send you a card with basic information including the assigned MCO. You should keep this card in your wallet. It is important to remember that for follow-up medical care with an Ohio medical provider, the provider must be a BWC certified provider. The BWC requires specific credentials to be a certified provider. Not all doctors want to treat Workers’ Compensation injuries or be a certified provider. Under the law, the injured worker has a free choice of a treating doctor, as long as that doctor is a certified provider and is authorized by the MCO as your physician of record in the claim. The BWC and the MCO maintains a fee schedule payment with their provider groups. Under the law, healthcare providers cannot collect the balance of a bill if the BWC, MCO or QHP (in self-insured claims) finds that the bill is payable but limits the amount of payment within the fee schedule. In other words, the healthcare provider, in such cases, cannot bill the injured worker for any balances or copayments. Additionally, providers may not bill or seek payment directly from the injured worker for services being medically unnecessary. In the managed care program for self-insured employers (and some eligible State Fund employers), medical management and payment are governed under a Qualified Health Plan (QHP) which has similar requirements as those under the MCO program. In addition, most self-injured employers contract with a third party administrator (TPA) to assist in the Workers’ Compensation claims management. Remember, you, as the injured worker, can choose your own treating physician as long as that physician is certified and is willing to treat you under the Ohio Workers’ Compensation program. The BWC of the self-insured employer cannot force you to be treated by its own chosen doctor. In State Fund claims, if treatments, diagnostic tests or healthcare provider bills are denied by the MCO, there is a very specific alternate dispute resolution (ADR) process to timely appeal such denials. The initial appeal process is usually performed by the healthcare provider. However, if the BWC upholds the denial, then the injured worker must timely file an appeal from the BWC Order in order to proceed to a hearing before the Industrial Commission of Ohio. In self-insured claims, if the employer issues a denial, then either that employer can request a hearing before the ICO, or the injured worker can file a C-86 Motion requesting such a hearing. A medical bill will only be considered for payment if filed with the BWC within two (2) years of the date of treatment or service. It is therefore important to make sure that your healthcare provider timely submits its bills to avoid a Statue of Limitations problem. Temporary total compensation payments are available to an injured worker who is totally disabled from work and who suffers a total loss of wages as a direct result of the injury or occupational disease. TT is intended to be a substitute for loss of wages. TT is not paid for the first 7 days of missed time from work, unless the injured worker experiences 2 weeks of continuous temporary total disability. If the employer continues to pay wages during the period of temporary total disability, then the employee is not entitled to receiver TT. If sickness and accident insurance benefits are paid for a period of temporary total disability, and the employer has made the entire premium payment for such benefits, then the employee is only entitled to TT for the period and the amount which exceeds the non-occupational insurance benefit. If the injured worker is claiming a period of temporary total disability in his/her Workers’ Compensation claim, the employee should notify the BWC or the self-insured employer whether they have received unemployment compensation over the same period of time. In such case, the BWC or self-insured employer will deduct for the TT award up to the amount of unemployment benefits and then reimburse the Ohio Department of Job and Family Services (ODJFS). It is important to remember that if the injured worker is claiming inconsistent with the requirements of unemployment compensation that the employee is ready, willing and able to work but suitable employment is not available. Under the law, the injured worker is not paid full wages by the BWC or self-insured employer. For the first 12 weeks of temporary total disability, TT is paid at 72% of the full weekly wage (FWW) subject to the maximum weekly limit, and thereafter paid at 2/3 of the average weekly wage (AWW) subject to the maximum weekly limit established by the year of injury. It is important to make sure that all gross wages for the year prior to injury are submitted to the BWC of SI employer so that your weekly compensation rate can be properly established. If the employee has a second job and continues to work and be paid wages, then the employee is not entitled to TT payments. To receive TT payments, it is not necessary that the injured worker be absolutely helpless or bedridden. TT is payable if the work injury and related disability prevents the injured worker from significantly performing his/her job duties of the position of employment held at the time of injury. The requirements to receive TT are: (1) Not working anywhere; (2) Be under medical care of a physician recognized as the treating physician in the claim; (3) Have the written certification of a treating physician that the claimant is not able to return to his/her job duties performed at the time of the injury (4) Reliable medical evidence must be submitted that this disability is caused solely by the allowed conditions in the claim. As the name implies, temporary total disability compensation is only paid for a period of total disability which is temporary in nature. TT is not a lifetime payment for an indefinite period of time. TT is terminated when the injured worker: (1) returns to work; (2) reaches maximum medical improvement (MMI); (3) activities are inconsistent with TTD status; (4) the employer makes a bona fide written job offer within the workers’ stated restrictions; (5) the employee voluntarily retires or abandons the work force; (6) in certain cases where the employee is fired for violation of a known written work rule or policy; or (7) incarceration. The usual reason for termination of TT is based upon the employee’s return to work or a finding that the claimant’s condition has reached MMI. If TT is terminated based upon MMI, TT may again be awarded at a later time if there are new and changed circumstances to warrant a reinstatement of TT (ie., surgery or documented severe exacerbation of the allowed conditions). In such cases, the injured worker has the burden to establish that there is a worsening of an allowed condition. Additional allowance of new conditions may be a basis for further TT payments. Wage loss payments are considered a “bridge” between the termination of TT and the subsequent payment of lower wages or zero wages as directly caused by the allowed injury/conditions. The purpose of wage loss is to encourage a return to work. The BWC has greatly tightened up the requirements to receive such wage loss as such payments can be expensive for the BWC and often have a negative impact on the employer’s premiums. There are two types of wage loss compensation: (1) Working Wage Loss (WWL) (2) Non-working wage loss (NWWL). If the injured worker returns to his/her former position of employment (the job they held at the time of the injury) or returns to another employer and makes the same amount of money as the set average weekly wage (AWW) in the claim, there is no wage loss. WWL is usually easier to establish than NWWL. The injured worker returns to the former position of employment and has confirmed wage loss less than the AWW of returns to work other than the former position of employment and is paid gross wages less than the AWW. There must be a direct connection between the allowed conditions and the wage loss and there must be medical proof of physical capabilities (written restrictions from the attending physician). NWWL has stricter requirements. If the injured worker does not find suitable employment within his/her written physical restrictions, the BWC’s specific requirements make it clear that it is the injured worker’s full time job to look for work within the physical restrictions. The injured worker will be required to keep in depth written job search efforts establish a good faith attempt to find suitable employment within the restrictions. Bad faith job search efforts might include very few contacts with prospective employers, looking for work which clearly exceeds the physical restrictions, or looking for work which clearly exceeds the injured workers’ educational and skill level (ie., a window cleaner looking for a job as a stockbroker). Written work restrictions from the treating physician must be updated periodically according to the BWC rules. Wage loss compensation is paid at the rate which equals the difference between the AWW and each gross weekly earnings (from below the AWW down to zero) multiplied by two-thirds (2/3). Wage loss can be paid to a maximum of 200 weeks for injuries occurring prior to 6-30-06. After 6-30-06, there are a number of situations which result in a more limited period of wage loss payments as well as certain offsets with rehabilitation wage loss payments. There are two types of permanent partial disability: (1) A residual disability award and (2) a scheduled loss award. A residual disability award is the closest form of compensation under Workers’ Compensation law to a damage award. It does not compensate for loss of earnings. There is a specific time period under the law which must elapse from either the date of injury or from the last date of payment of TT or WWL payments before the injured worker is eligible to file for such an award. Unfortunately, as a general rule, these awards are much lower today than they were 20 years ago mainly due to the BWC’s usage of the Guides to the Evaluation of Permanent Impairment (AMA Guides). As a result of these lower awards, attorneys for injured workers are often filing appeals, obtaining their own medical evidence and appearing at a hearing before the Industrial Commission to try and obtain a fairer and higher award. Under the law since 1963, the injured worker cannot be paid more than 100% permanent partial disability in his/her claim(s). There is also a maximum weekly rate under the law for the year of injury. The injured worker may be entitled to an award for an increase in permanent partial disability if there are new and changed conditions to establish such increased disability. A scheduled loss award is for a loss, or loss of use of specific members of the body. If the injured worker’s hand is amputated in a punch press, there are a specific number of weeks of compensation to which that worker is entitled to under the law. In certain cases, there may also be a “loss of use award” which means the injured worker has lost the use of the affected parts of the body to the same extent as if they had been amputated or removed. This usually involves fingers or thumbs, paralysis or total dysfunction of a limb. However, this type of award excludes loss of use of toes. Corrected loss of vision above a certain percentage as well as total and permanent hearing loss may also be awarded. There is also a statutory provision for facial or head disfigurements. Scheduled losses are paid at the maximum state average weekly wage for the year of the injury. The awards are not dependent upon an injured workers’ average weekly wage. There is no eligibility waiting period to pursue such an award. If the injured worker is permanently unable to return to the work force due to the allowed conditions/injuries, such worker may be eligible to receive lifetime payments. Due to the costly nature of such benefits, there are very strict requirements and rules governing being declared PTD by the Industrial Commission. In rare cases, there may be a “statutory PTD” where the injured worker sustains a loss of two or more specified body parts (ie., both legs are amputated or an arm and leg are amputated). The more common form of PTD requires that the injured worker no longer has the ability to work at any sustained remunerative employment and that the disability, within a reasonable probability, will continue for an indefinite time without any indication of recovery from the disability. PTD cannot be awarded if the disability is a combination of allowed and non-allowed conditions (ie., serious low back condition and an unrelated heart condition). The impairment cannot be based solely upon the employee’s age or aging. Additionally, if the injured worker has retired or otherwise voluntarily abandoned the work force for reasons unrelated to the allowed injury or occupational disease, PTD cannot be awarded. In most cases, a hearing is held before the Industrial Commission to decide whether to award PTD. It is therefore important that the evidence in the claim and documentation carefully be built before attending any hearing. An experienced attorney can help build the evidence toward pursuing a PTD award. In some cases, where the medical impairments based solely upon the allowed conditions results in PTD, the Industrial Commission may award PTD without considering factors such as age, education and work experience or other relevant factors. If the issue of PTD goes to a hearing, the Industrial Commission will also determine whether the injured worker has made prior good faith rehabilitation efforts to enhance the employee’s employability unless such efforts are determined to be in vain. PTD will be terminated for periods of incarceration or if the injured worker is found to be working or is carrying out activities inconsistent with PTD. In certain cases, injured workers awarded PTD may be entitled to a subsidy under the Disabled Workers’ Relief Fund (DWRF) if their weekly or monthly PTD payments fall below the threshold amount set by the BWC each year. Payment of Social Security disability benefits will be combined with the PTD payments to determine DWRF eligibility. Social Security retirement or private disability payments are not included in the determination process. It is important to keep in mind that disability benefits from other governmental agencies or private entities have their own established criteria for paying long term disability benefits. Therefore, just because an individual is receiving Social Security disability or a disability pension does not mean that the individual meets the PTD requirements under the Workers’ Compensation law. Living maintenance (LM) is compensation paid to the injured worker with a potential for rehabilitation and who agree to participate in the rehabilitation program. It is a substitute for temporary total compensation. Living maintenance payments are equal to the amount the injured worker would receive for TT compensation, but with a minimum weekly amount no less than 50% of the current state average weekly wage (SAWW). An injured worker who remains in the rehabilitation program may receive LM payments for a period or periods which should not exceed a total of 6 months. For an injured worker who completes the rehabilitation program and successfully returns to work but experiences wage loss upon reemployment, living maintenance wage loss compensation (LMWL) may be paid by the BWC as long as supported by medical documentation of limitations due to the allowed conditions, completion of wage statements and a good faith showing that the employee has not voluntarily limited his/her income. The injured worker may receive up to a maximum of 200 weeks of LMWL. Anyone can refer an injured worker for vocational rehabilitation including the BWC. While rehabilitation is voluntary for the injured worker, failure to participate in the rehabilitation program could have a negative impact for the injured worker later if he/she files for PTD. An injured worker is eligible for rehabilitation services when the allowed injury creates a significant impediment to return to employment or to maintain employment (job retention). Usually, the injured worker is already receiving temporary total compensation at the time of acceptance into the rehabilitation program. It should be kept in mind that the BWC’s rehabilitation program has nothing to do with the Bureau of Vocational Rehabilitation Agency (BVR). Where an injured worker dies as a result of a work-related injury or occupational disease, any person(s) wholly or partially dependent upon the deceased injured worker for support at the time of death may be entitled to benefits of a weekly death compensation award, medical and funeral expenses and any compensation which accrued prior to the date of death. Some death claims are more obvious than others. If a scaffolding breaks and the worker falls to his death, or if the injured worker is in a trench dug by the employer which caves in, death benefits may be paid if all conditions are met under the law. However, there may also be the potential of a Violation of Specific Safety Requirement award (VSSR) against the employer. If a crane hook snaps and falls down killing a worker on a construction site, death benefits may be paid if all legal requirements are met. However, there may also be a third party action (personal injury case) against the manufacturer of the crane or another company which company owned and operated or maintained the crane. Death benefits might also be awarded if the injured worker dies as a direct result of the allowed medical conditions in his/her Workers’ Compensation claim. For example, in a claim previously allowed for a pre-existing diabetic condition, if the injured worker later dies from complications directly related to that condition, death benefits may be available. If the injured worker has a claim previously allowed for substantial aggravation or acceleration of coronary artery disease which resulted in a heart attack (myocardia infarction), a death claim application should be considered. The key is for the dependent to prove that the injury or occupational disease was the proximate cause of the death or accelerated the death, and that the death claim be filed within 2 years from the date of death. The types of recoveries for a death of an employee could result from a prior allowed claim, death occurring where no prior claim was filed, death resulting from a compensable injury or disease, or death where no dependents survive the decedent and the application is made by one other than the dependent. The right of the deceased injured worker’s dependent to file a claim is independent of that deceased person’s claim while alive and must be evaluated on its own merits. The injury or disease must have occurred in the course of and arising out of employment, must not be purposely self-inflicted or caused by intoxication or overdose of a non-prescribed substance and must be a direct and proximate result of the injury or disease, either directly or by way of aggravation or acceleration of a pre-existing condition that substantially hastens death. Although the death of an injured worker permanently terminates payment of future compensation in that employee’s Workers’ Compensation claim, dependents may apply for payment of compensation that is accrued and due to the decedent at the time of death or compensation that went to the decedent would have been otherwise entitled to if he/she had filed for such compensation. In addition to other forms of compensation under Ohio Workers’ Compensation, an injured worker/employee may be entitled to an additional award if that employee can establish that the occurrence or condition giving rise to the claim was caused by the employer’s violation of a specific safety requirement. VSSR awards are considered to be a penalty against the employer and are distinct from other compensation payments. The safety requirements must be specific as set forth by the Legislature which impose a duty upon an employer. The Industrial Commission of Ohio has established safety codes covering construction, workshops and factories, operation of elevators, metal casting, steel mills, laundering and dry cleaning, rubber and plastic industries, window cleaning and fire fighting. Violation of a general safety rule or law does not arise to a VSSR. If, for example, an employer removes the safety devices on a punch press and the injured worker as a direct result of this action, suffers an amputated hand, then a VSSR award might be worth investigating and pursuing. In such case, an intentional tort action (a direct personal injury lawsuit against the employer) might also be considered under the circumstances. If the Industrial Commission finds a VSSR, then this award can range between 15 to 50% of the maximum award established by the Legislature for the year of the injury. For example, if the Industrial Commission finds a 40% VSSR, an additional 40% of the compensation paid in the claim would be tacked on as payment to the injured worker. Since a VSSR penalty is tacked on against the employer, employer’s will usually bitterly fight an application for a VSSR award. An experienced Ohio Workers’ Compensation attorney can assist the injured worker in investigating, filing and pursuing a VSSR against the employer. There are different reasons why an injured worker might want to consider a full lump sum settlement of his/her Ohio Workers’ Compensation claim. No one can force an injured worker to settle a claim, and settlement of a claim should be carefully weighed and considered by the injured worker. Factors to consider in a possible lump sum settlement of a claim might be the injured workers’ financial situation, an end to lengthy administrative delays in the claim, an injured worker’s decision to manage his/her own funds and payments, attempting to obtain some money in an older Workers’ Compensation claim or avoiding lengthy and expensive litigation in the claim, either at the administrative level or in the Court of Common Pleas. In some cases, the BWC has sent written inquiries to claimants expressing an interest in possible lump sum settlement of the claim. The employer or its representatives may also send a written inquiry to the injured worker as to possible lump sum settlement. However, just because the BWC or the employer wants to settle a claim does not always mean that this in the injured worker’s best interest. Furthermore, the BWC or employer usually want to consider a much lower settlement amount than the claim may be worth. Unless the injured worker has the experience and knowledge of determining the value of a claim and in handling the negotiation process, it is best to consult with an experienced Ohio Workers’ Compensation attorney. Most injured workers do not have the background to properly evaluate the monetary worth of a claim. The value of the claim is not simply based upon the amount of money which you need, but is based upon a number of factors. The employer and the BWC have their own needs and considerations. If the claim has already been allowed and benefits paid, then future cost exposure to the BWC or employer plays a strong role in accessing the value of the claim. If the injured worker is receiving permanent total disability compensation, then under certain circumstances, the claim might be considered for lump sum settlement. However, the BWC and self-insured employers often “low ball” the value of such claims which can be adverse to the interest of the injured worker. Therefore, an experienced attorney can help the injured worker with the evaluation and negotiation process. Disclaimer: Material provided in this website is for informational purposes only. Visiting a website does not establish an attorney-client relationship between you and any lawyer in our law firm. The information on this website does not constitute legal advice and does not intend to address any specific case.